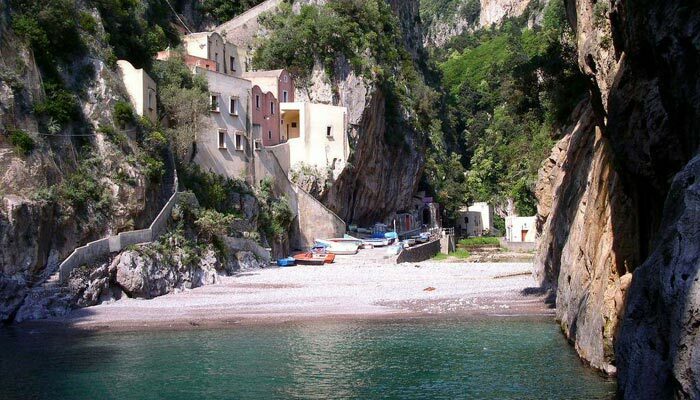 Furore and its Fjord are one of the most spectacular spot on the Amalfi Coast. The little village is close to Praiano and to the Hotel Torre Saracena. You could visit it by our shuttle and have a lunch or a dinner in a romantic restaurant affiliated with us. A group of escaping Romans, barbarians at their backs, took refuge in these mountains, and founded the first settlements of Furore. The town has remained, thanks to its particular topology, an unassailable stronghold, even during the times of the Saracen raids. The bay makes for a natural port, where trade flourished, encouraging the growth of the burgeoning paper industry and agriculture: the waters of the Schiato river powered paper and grain mills as they descended from the Lattari mountains. Furore takes its name from the particular fury with which the sea batters the Amalfi Coast and into the Fjord during storms, and from the deafening, terrifying roar of the waves against the cliffs and in the bay..
Furore is called the painted village because in the upper part, the walls along the main road to Agerola are painted by famous artists. Furore is also called “the village that doesn’t exist” because in the past its houses were well hidden into the hill to not be seen from the sea and the pirates. There are a lot of legends on the Amalfi Coast collected to Furore: his name represent the Fury of the sea in the Fjord but also the fury of the devil, when it passed for this town but the inhabitants were unwelcoming with him. 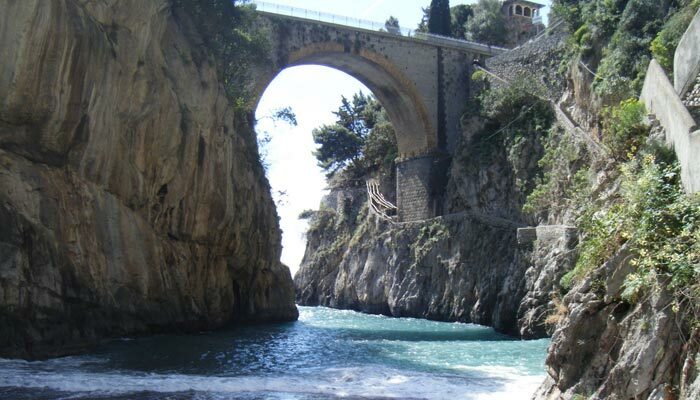 You could arrive to Furore and to the Fjord on the Amalfi Coast, using public transport from Praiano to Amalfi. The bus stop is just in front the Hotel Torre Saracena. Furore has four ancient churches: San Giacomo, San Michele, Sant’Elia and Santa Maria Della Pietà, the latter once home to one of the most important and prestigious confraternities of the Diocese. The fjord is a deep cleft in the rock, formed originally by a stream almost always dry, the Schiato, which swoops down from the edge of the plateau of Agerola. The cliffs, the vegetation that clings in the cracks of the walls, the houses groups obtained with persistence in soil, the sound of waves crashing against the ravines of the coast, deep color of the sea have made the fjord an episode natural and anthropogenic one of great beauty.